Sennheiser Communications headsets provide integrated solutions for professional telecommunications and high quality multimedia applications. Sennheiser multimedia headsets help improve the quality of your time at the PC, whether it is for business, pleasure or pro-gaming. 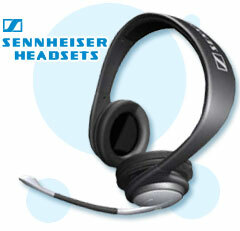 Sennheiser professional headsets serve to increase the efficiency of communication in contact centers and office environments. They can also be used with some cellular phones, helping improve mobile telephone conversations. They're light and comfortable to wear, leaving you free to work without distraction. Hour-long game playing and internet surfing on your PC will become an exciting experience. Noise cancelling microphones, inline volume controls and the microphone mute function are among the many benefits. They're exceptionally comfortable and will easily turn your internet-telephone calls into hours of inexpensive fun. When you have to concentrate, and when attention to detail is very important, Sennheiser headsets help you to stay on top of the job. The Telecom headsets are light and comfortable to wear, allowing you to keep your hands free to work without distraction. Five brand new Office headsets (SH Series), and five state-of-the-art Contact Center headsets (CC Series) bring you top-quality performance.